Nose: Smoke, sweet vanilla, peat, white chocolate-cookies. 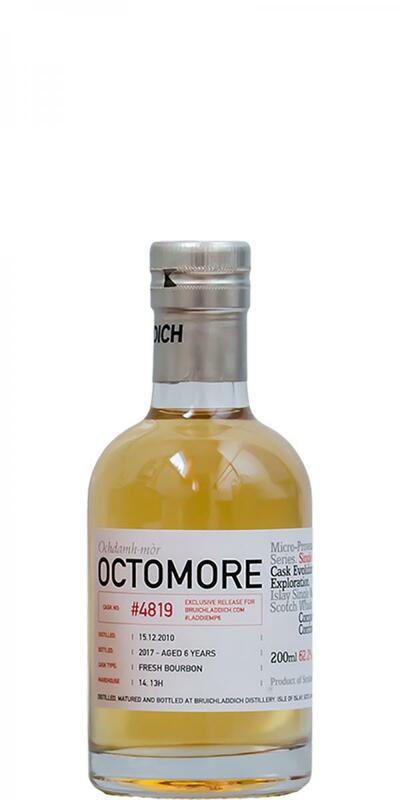 Pretty typical Octomore-nose. Unluckily not very complex. Taste: Disappointing one-dimensional. More smoke and vanilla, and that's it pretty much. Little bit of harsh bitterness, might be the alcohol although I added some drops of water. Finish: Rather short to Medium long. Smoke. Pour a glass and forget your worries. Blimey - I could smell that from halfway across the room - peat smoke dominates. Considering the strength a surprising gentle mouth feel - very pleasant at a time of doom and gloom. In the nose, a lot of alcohol, which one must avoid. Doing so, subtle vanilla and citrus notes unfold, just as one would expect from a Bourbon Cask maturation. In the mouth one expects a very strong start, the 62,2% are clearly noticeable. First, the citrus notes put through here, the vanilla from the nose can only be guessed. He reminds me very much of a good grappa. A little water reduces the alcoholic sharpness to a tolerable level, but this hardly changes the basic character of the malts. I stay with Grappa. 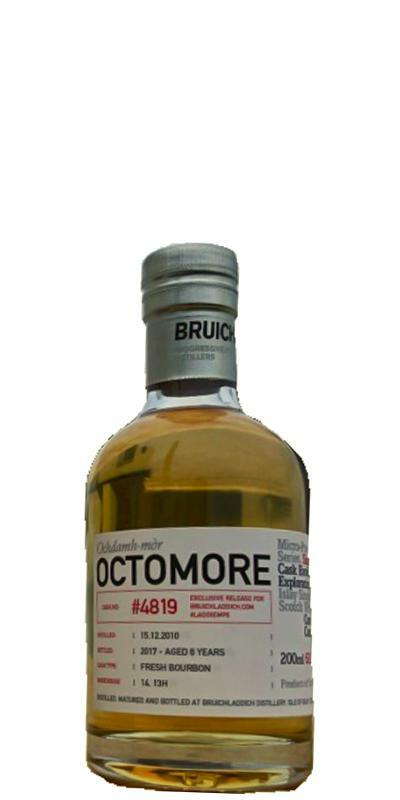 The finish is relatively short and accompanied at the beginning by a pleasant woody note, then again citrus ... and, sorry, pomace distillate. Conclusion: For me, the 4819 is the least attractive malt from the # LADDIEMP6 set. In neutral terms, though, one has to say that it is something special in its own way and therefore fits well into the set. But I ordered whisky, not grappa. 83 points.